If the last few weeks have taught me anything, it’s that age hasn’t made me any more thick-skinned. However many years in the world I live, very little prodding can be enough to bring me to tears. Happy, sad, stressed, angry – my eyes start to prick, a lump rises in my throat. Add in hormones and I’m a full blown mess of tears, puffy-faced and panda-eyed as my eyeliner slinks away. I’ve spent most of life trying to push down these emotional outbursts, seeking solace in toilet cubicles or holding back until I can speak to a friend. The embarrassment of being seen crying by anyone but your closest friends, let alone by people at work, engrained in our “stiff upper lip” British culture. And seemingly worse still for men, whom society can stereotype into silence. But recently I’ve come to realise that maybe not crying doesn’t equal being ‘strong’. That in some ways, letting the facade slip away is painful but brave. Admitting vulnerability is terrifying, but the honesty of it prompts real, genuine exchanges. 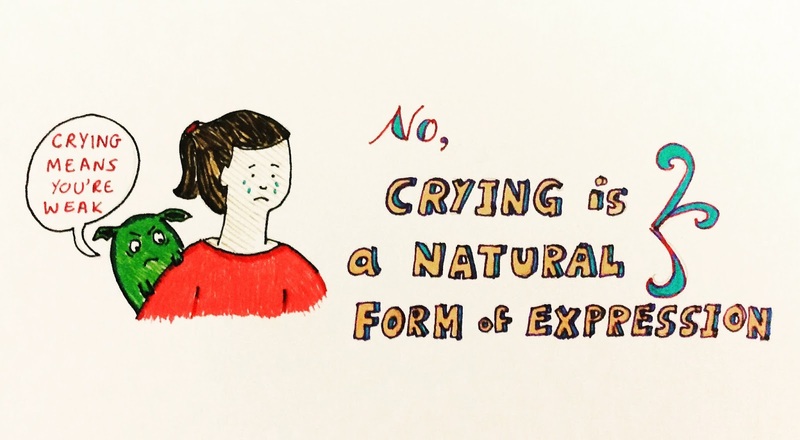 And maybe, crying isn’t ‘going to pieces’, but a natural expression of feeling. Please don’t get me wrong, there are cryers and non-cryers, and each is as natural as the other. I’ve spoken to friends in the past who’ve felt bad for not crying, worried in some way that this wasn’t right. It works both ways, don’t cry at work but do cry at your best friend’s wedding, whatever you do don’t cry on public transport, but you must have a heart of stone if you don’t cry at a funeral. Never mind that the tears on the bus could be for the very same reason; the context isn’t appropriate. Our culture enforces these expectations, but how freeing would it be if we could allow each person to process emotion in the way that fits them? I’m not pretending I won’t still be embarrassed next time I cry, but maybe I’ll start learning to cut myself some slack.